Landing your dream job as a social media manager, coordinator, or specialist will start with a killer resume. The easiest way to get to the top of any company’s callback list is by using this example and list of specialized writing tips. On the other hand, if you’re eager to get that dream job ASAP, save yourself some time by using our fast and effective resume builder. Want to see samples from other industries? Explore our resume database. Not your favorite design? Find a resume template that you love. Time to work on your cover letter? Check out our expansive collection of cover letter samples for some inspiration. Social Media Marketing Professional with 4+ years of experience. Committed to elevating ABC Company’s digital reputation and promoting brand awareness through the role of Social Media Manager. Possess a Bachelor of Arts in Communication Studies, a MOZ SEO certification, and an Udemy social media marketing certification. Land your dream job with these four expert tips! What does this company need? How can I meet those needs? Answering these questions is a critical step in showing that you are the ideal candidate for the job. Every company uses social media for a unique purpose. Are they trying to promote an image? Sell a product? Acquire subscribers? What is their overall vision for the company and how are they using social media to fulfill that vision? Use the company website and the details of the job posting to help answer these questions. Once you have a grasp on the needs of the company, consider how YOU are best able to meet those needs. What experience, skills, education, and certifications are you bringing to the table, and how will those attributes help the company reach their goals? Keep in mind that this is only a glimpse of what you have to offer. Use this section to highlight your most appealing qualifications, then flesh them out throughout the rest of the resume. In formulating your career objective, build from our standard 3-sentence structure. The first sentence should state your profession and years of experience. Dedicated professional with 5+ years of experience in social media marketing. Lead in with a blanket statement of who you are. Notice in the above example the word “dedicated.” Don’t be afraid to throw in an adjective that captures what you have to offer. Another option is to immediately reference a certificate you hold. SEO certified social media marketing professional with 5+ years of experience. Keep this introductory sentence simple, but make it strong by finding the adjective that best fits who you are and what the company needs. What does the company need? Use this sentence to state how you can contribute to the mission of the company. Seeking to use background in web design and extensive knowledge of visual content trends to enhance the social media presence of ABC Industries. Once again, choose your strongest qualifications here and how you will use them to meet the broad needs of the company. Once you have the hiring manager hooked with your career objective, they will continue reading about the details of what you have to offer. The third sentence should draw attention to any specialized education and certifications that you hold. Possess Bachelor of Science in Marketing with a minor in Web Design and a CIW certification for UX design. As you can see in the example, the candidate lists both formal education and a specialized certificate. Doing so shows the hiring manager what proven skills you have to offer. For more help writing the perfect career objective, check out our How to Write a Winning Resume Objective page for a step-by-step guide. The role of the digital marketing team is to promote a company or product online. How does your team measure the success of that promotion? Let’s talk about your Professional Experience section. Embedded in these two ideas is a range of other achievements that can — and should — be promoted in your resume. When considering what you accomplished, quantify your achievements. Rather than just saying you did something, state what positive effect that action had by using numerical evidence. Take the time to crunch the numbers. Lucky for you, your experience in social media is already documented online. Check the stats of your previous endeavors (likes, shares, follows, etc.) to find some compelling numbers to put here. Use the Skills section to highlight the range of your abilities and emphasize the specific qualifications that will set you apart from other applicants. Social media is not a cut-and-dry field. Succeeding in the digital marketing arena takes a variety of skills and knowledge across multiple areas of expertise. Consider your unique education, experience, and certifications. Do you have knowledge of social media analytics or management programs? Make sure to emphasize that in your Skills section by mentioning relevant training programs, certifications, or software that you are well-versed in (consider programs such as Google Analytics, IBM Watson, Hootsuite, Buffer, Zoho Social, etc…). Perhaps you have an affinity for visually-based content. List out any background, education, or certifications you have in web design or video production, or draw attention to your understanding of how visual content trends on various platforms. Don’ forget to emphasize what a talented writer you are. The heart of a career in social media is crafting persuasive content that draws in users. Ensure that your future employer knows what a competent wordsmith you are by including any composition-based education, background in copywriting, or proficiency in writing programs. The ideal candidate will boast a combination of the above skills. To keep this section organized and reader-friendly, make sure to categorize your skills. By doing this, a hiring manager can quickly gauge the range of skills you have to offer and skim the details of those qualifications. Notice the last skills category in the example above. While you should lead with your most effective qualifications, consider including some soft skills that lend to your success in the social media field. For more details on writing your Skills section, check out our How to Write a Skills Section for a Resume guide. A resume designed for a position in this industry is one of the few which allows for the inclusion of links. Have you spearheaded a product campaign or created a particularly effective social media page? Don’t be afraid to include a link to that site in parentheses next to the accompanying professional experience bullet point. But…don’t go overboard. Keep in mind that this is not a portfolio. Only include a link when it is particularly beneficial in showcasing what you can do or documenting the specific achievement to which you are referring. If you have an array of links that you would like to include, consider consolidating them into an online portfolio that can be accessed through a single link. Ready to get that job? 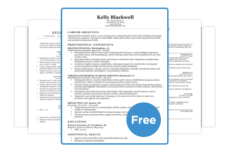 Take advantage of our large number of free downloadable resume templates. If you’re in a hurry to score the perfect position, our resume generator can help you construct your own in minutes.